On a recent bright autumnal morning we decided to prepare brunch outside in the garden for a couple of friends. We had been talking about the fun of preparing meals while camping, there is something rewarding about cooking over a camp fire. It’s the process of collecting the wood, lighting the fire, it all feels very primal. We wanted to make a good hearty, warming breakfast dish – and all to be prepared in one dish. So we went for eggs, bacon and beans. We constructed a table out of two bricks and a plank of wood and got to work. Started with the streaky bacon and went from there. Meanwhile our friends turned up with some fresh crusty bread and a thermos of bullshot. Think of bullshot as winters alternative to the Bloody Mary – the hair of the dog. It is a mixture of vodka, beef consume, tobasco, Worcestershire sauce, lemon juice, black pepper and then served hot, funny as it sounds it does the trick on a nippy winters morning. 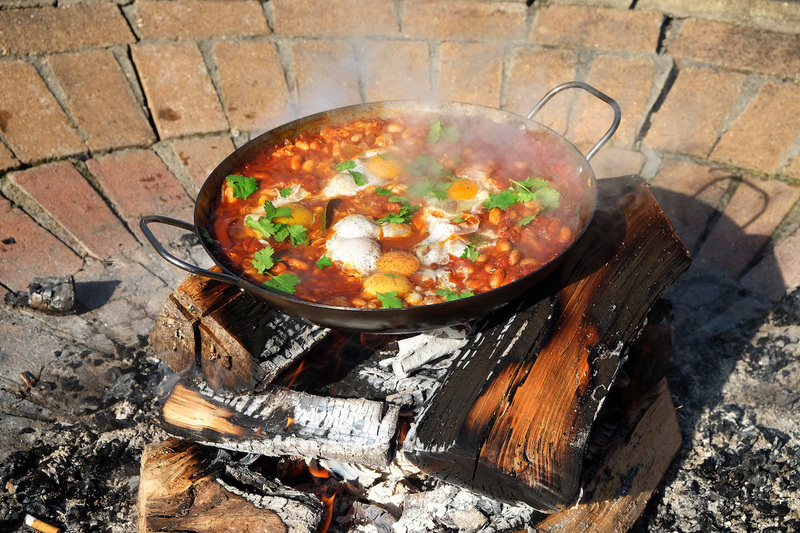 We delicately tried to balance our pan above the fire without burning ourselves and started cooking and it worked well, although cooked very fast over the flames so was ready in no time, we cracked in a couple of eggs and there we had it – our eggs, bacon and beans. If you are not wanting to go to the trouble to cooking your brunch outside then this would do very nicely being cooked inside on the hob and you will still achieve the smoky flavour from the chipotle paste. This dish has really inspired us and we are thinking of investing in a fire pit for our small garden in London – you can pick them up quite inexpensively online. 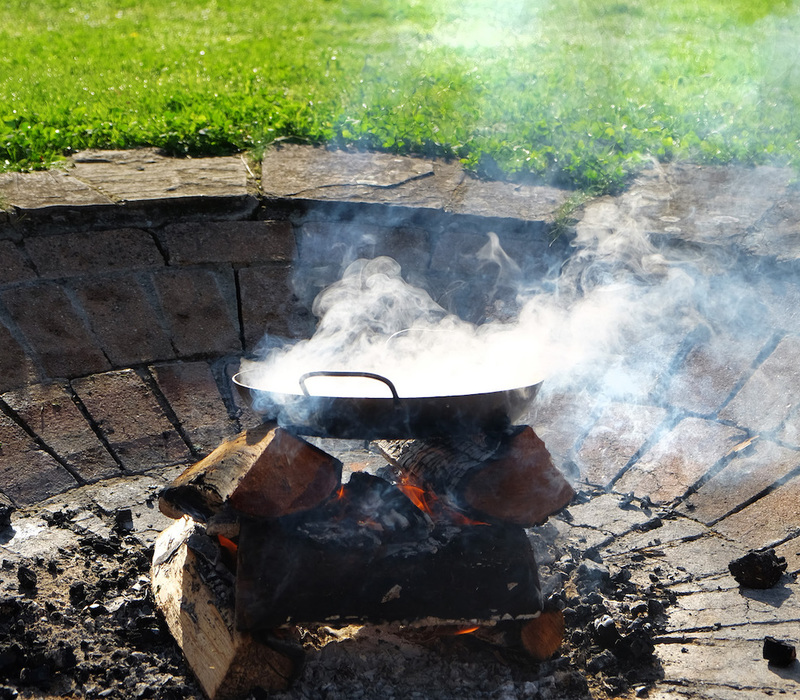 We have barbeques in the summer so why not a fire pit for the winter, we love the idea of cooking over an open fire – even if it just marshmallows! There is a wonderful Argentinian chef called Francis Mallmann who is an expert on cooking over and in fires, the best steak we have ever had was at his restaurant in Buenos Aries, and have been thinking about it ever since. So we popped down to Daunt Books in Marylebone and picked up his book for some inspiration, it is defiantly worth it, what a life he leads. 1. Heat a pan over a medium heat and add a little oil and the bacon. Once it has started to crisp add the onion, garlic, thyme and bay leaves, cook for 5 minutes till softened. Add the smoked paprika, chipotle, cumin seeds, tomato paste, the chopped tomatoes, maple syrup and the cannellini beans and mix together, simmer for about 10 minutes, taste and season. 2. With a spoon make 4 wells in the bean mixture and crack in the eggs, cooked till the eggs are cooked and sprinkle over the coriander. Serve with some warm bread.